I finished King of Thorns over a week ago. Every time I get around to writing this review, I blank because I can’t write anything that does this book justice. Like its predecessor, King of Thorns is a bloody romp. King of Thorns’ story structure, characterization, and Jorg’s character progression all serve to make King of Thorns a much better-realized and ultimately stronger book than Prince of Thorns. Jorg Ancrath is a cunning teenage king that has cheated, stolen, raped, pillaged, and murdered his way to the top. Much like its predecessor, King of Thorns is split between two timelines. The first takes place just after the events of Prince of Thorns, with Jorg having taken the title King of Renar from his uncle. When Gog, Jorg’s young leucrota friend, has a fiery problem, Jorg sets off with his Road Brothers to find a solution, a fire warlock that will hopefully rein in Gog’s dangerous outbursts. In the future timeline, it’s Jorg’s wedding day. Unfortunately for Jorg, his wedding is about to be crashed by the twenty-thousand-man army of The Prince of Arrow. With few resources and a scant number of swordsmen, Jorg faces his most difficult challenge yet. The only thing that could possibly save him is a small, thorn-patterned copper box. In both timelines, Jorg struggles to shake the reins of fate that unseen forces tie around his neck. After all, it’s not in his nature to be led. But a man can’t subdue the world alone. With his Road Brothers, Jorg tries to uncover the hidden secrets of The Builders, giving him an edge the likes of which this world has not seen for thousands of years. Jorg Ancrath is my favorite character right now, probably top three all time. His character voice is astoundingly well-written. Even though he’s a deviant, selfish child that does horrible things, I love Jorg and I want him to win. I don’t know what that says about me, but there it is. It bears mentioning that James Clamp does a S I N G U L A R performance with Jorg, pulling an already-vivid character into being with terrifying lucidity. Best narration I’ve heard this year. I feel like I’m reading Mark Lawrence’s books in reverse! After starting with Red Sister, I’ve gone back and read Prince of Thorns and now King of Thorns (with Grey Sister in between). You’d think that since King of Thorns was one of Mark Lawrence’s first books, the quality might be a touch lower than more recent books like Grey Sister. You’d be wrong. 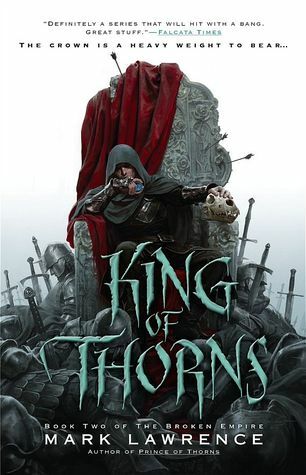 King of Thorns is what makes fantasy such a fun genre. Sure, people love grit and grim, but there’s plenty more to be had. What Mark Lawrence does best is sprinkle bits of curiosity throughout his books. Figuring out the mysteries of Jorg’s world inspires a sense of wonder and lends itself to a fantastically engaging read. If you only read Prince of Thorns and are considering King of Thorns, be good to yourself. Read this book. It’s a damn good one.